'I was born on 25th May, 1938, in the front bedroom of a house in Orton Road, a house on the outer edges of Raffles, a council estate. I was a lucky girl.' 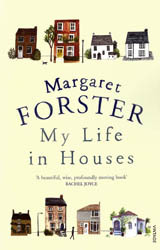 So begins the late Margaret Forster's last biographical work, a journey through the houses she's lived in, from that sparkling new council house, to her beloved London home. This is not a book about bricks and mortar though. This is a book about what houses are to us, the effect they have on the way we live our lives and the changing nature of our homes: from blacking grates and outside privies; to cities dominated by bedsits and lodgings; to the houses of today converted back into single dwellings. Finally, it is a gently insistent, personal inquiry into the meaning of home. Why not review this work for us?